Grand Central Market | Press Coverage | The Huffington Post | By Shane Paul Neil The best sandwiches don&#039;t necessarily have lines around the block. There are best-kept secrets from coast to coast. The best sandwiches don't necessarily have lines around the block. There are best-kept secrets from coast to coast. These are 10 sandwiches you probably never heard of, should make a trip for, snap an Instagram of and eat at least once in your life. Just like our tastes vary, so do our criteria for the perfect sandwich. These great sandwiches challenge your palate and make you feel things you didn't think were possible. Some are massive, some are simple with a twist. Some have tapped into popular culture while others feel nostalgic from the first bite. Like Silicon Valley, great chefs are being rewarded for taking chances and innovating. If you like beer, burgers, eggs, lobster, kimchi, wagyu and Cheetos you're in the right place. If you're not hungry, or hangry even, by the end of this mouth-watering list then you don't like sandwiches and are probably allergic to fun. 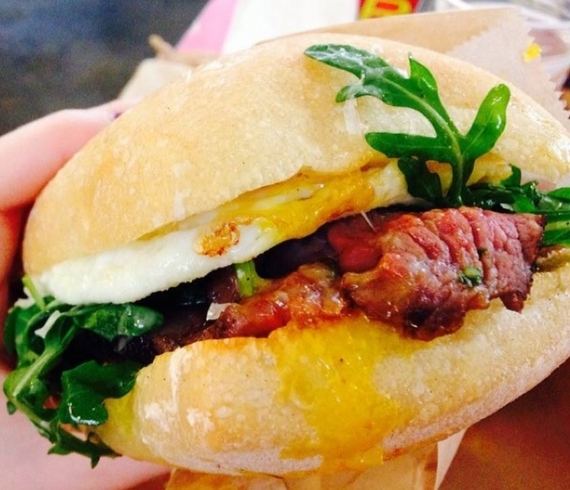 Seared wagyu tri-tip steak, chimichurri, red onions and seasoned arugula topped with an over medium egg, in a warm brioche bun. LA's iconic Grand Central Market, is known for some of the most creative food in the country. At the top of that list is a mix of comfort food, innovation and of course, eggs.